These 10 Eastern European Cities Will Ignite The Wanderlust In You! When you think ‘Eastern Europe’, I’m sure the first thing that comes to mind is “cheap holiday!”, and it sure is. Famous for being the first thing on a backpacker’s list, Eastern European countries are also quite underrated as most people don’t know where half of them are, nor know how to even pronounce them. But if you really take the time to get to know these cities, you’d realise they are rich with top-notch art, amazing food, astounding architecture and breath-taking views. Unconvinced? 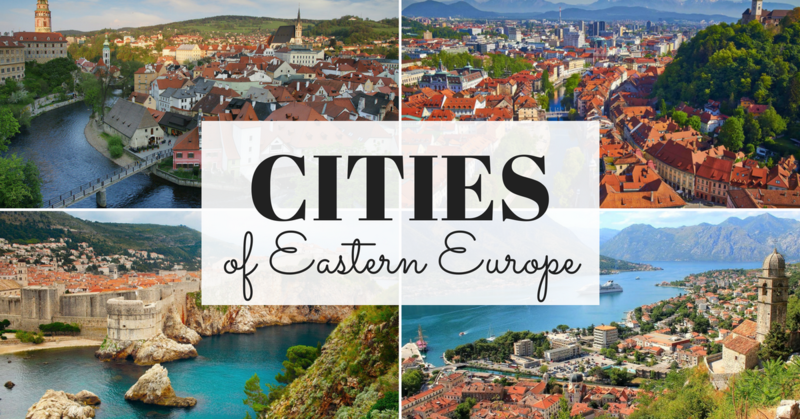 Here’s a list of some amazing cities in Eastern Europe to put on your bucket-list. On the southern end of Croatia lies this city, right along the gorgeous blue Adriatic Sea. With its winding streets and ancient city walls, this city packs a tonne of tourists visiting its art and history museums, and picturesque sights with some of the best European beaches. If you’re heading there, you need to visit Banje Beach, the closest beach to the Old Town, where you can catch breath-taking sunsets on the Adriatic, and if you want more gorgeous views, you can take the cable car up to the top of Srd Hill where you can see all of Dubrovnik. Familiar? Think Game of Thrones. Even though Poland has one of the most sombre historical spots, Krakow manages to be one of Europe’s most exciting and active city centres. If you want some old, historical adventure, visit their museums, the Schindler factory and the remnants of the Jewish Quarter. If you want a modern adventure, just head on to the Old Town and Main Market Square where modern cafés, clubs and shops lie. If you just want to relax, walk around their parks and public spaces along the Vistula River! I know what you’re thinking. But no, this city is far from dirty. This Montenegrin city is a well-loved European destination which is both romantic and exciting. With its ancient walls, medieval homes, and historical monuments, its attractions are always best enhanced by a backdrop of a wide blue bay. You can even get a guided tour of the ancient labyrinth-like streets or you can even hike up its gorgeous steep mountainsides. Its ancient walls were built between the 9th and 14th centuries, forming a protective loop around the city. Kotor’s food scene is influenced by Italy and other Mediterranean regions, heavy with seafood and paired perfectly with its local wine options. This ancient city of Slovenia used to be a Roman outpost about 2,000 years ago. Today, it’s a gorgeous green city, compact, traveller-friendly and vibrant with life. Take a stroll on its cobbled streets, explore its castles, enjoy its bustling squares and uncover its crazy nightlife as the locals sure know how to part hard. Its city has very restricted car traffic, making its city centre exceptionally green with many pedestrian-friendly paths, and you can also save a ton because it’s a university town beloved by backpackers – meaning that bars, restaurants, cafés and attractions are all budget friendly! If you love art, this city is one of Europe’s most progressive modern-art scenes; visit the Museum of Contemporary Art Metelkova and other galleries. Not to mention this amazing church! Known for its beautiful and cosy Christmas market, this city is also a truly great place to visit all year round too. Tallinn might have its fairy-tale-like charm but it also has shiny new skyscrapers and modern restaurants. This old town is UNESCO-approved, making this city look like it just came straight out of a fairy tale with its cobbled streets and rebuilt homes dating back to the 11th century. Tallinn is also known for its Bohemian-flavoured bars and café, whilst also priding itself in its curious antique shops specialising in unique Soviet-era trinkets! The charming Batislava is sadly under-visited and often compared to Vienna, but this destination is actually unique in its own way with the Danube River winds blowing through the city and a bustling ‘Old Town’ filled with touristy spots, bustling with people from various backgrounds. And if you like art, head on to their modern art galleries, and their Blue Church, which is indeed blue, right up to its blue-glazed roof. And if you like beer as much as I do, there’s a number of modern brewpubs and traditional bar that serve both local brews and also international beers. Bratislava’s markets has a charm of its own, and personally to me, it looks like a modern day Beauty and the Beast set, offering local goods such as clothing, flowers and even wine. Eastern European cities are famous for their unique architecture, but Riga stands on its own league when it comes to its gorgeous architectural designs with its combination of gargoyle-topped gothic buildings, shaded plazas and gingerbread homes. With the River Daugava and the Baltic Sea in its palms, it’s not surprising that aquatic activities are particularly popular in Riga. They also have a UNESCO-approved art nouveau town centre and gothic churches that have been around for centuries. I couldn’t pick one, so here’s two cities you should visit which are conveniently linked by one of the continent’s best rail trips which only costs £4 a ticket. Mostar is famous for its gorgeous bridge that goes over the turquoise Neretva river and runs alongside the rails. And on the way to Sarajevo, you can enjoy some breath-taking sceneries, rivalling anything from Switzerland or Norway. This Czech capital remains one of the world’s most romantic cities and is probably one of the more famous destinations on this list as it’s the 27th greatest city on Earth – according to Telegraph readers. You can walk along its cobbled lanes at Malá Strana where music is known to spill out windows and gorgeous gardens hide behind magnificent large gates. And if you love castles, you should head to the Prague Castle which dates back to the 9th century and according to the Guinness Book of Records, is the largest ancient castle in the world. If you like views, take a gander at the Charles Bridge and also the view from the Prague Castle. If you like old building and architecture, check out the gothic Powder Tower which is one of the original city gates separating Old Town from New Town, Church of Our Lady before Týn, a gothic church in Old Town, and the really awesome Prague astronomical clock, which is also in old town. Basically, if you like anything gothic, or bohemian, you’ll love Prague – or Czech Republic in general. And because I love beer, I’m going to mention that Czech beer has a long and important history with it first brewery known to have opened in 993. And if you love beers too, try out their famous pilsner style beer, which originated in the western Bohemian city of Plzeň where the first blond lager, Pilsner Urquell is still being produced. I’ve tried it and I’ll vouch for it. And if you feel like Prague’s too… ‘mainstream’ for you, you can take a train or a bus to Český Krumlov, a UNESCO-listed fairy tale-like city in South Bohemia, filled with renaissance and baroque architecture. It is divided by the Vltava river and is surrounded by verdant hills with towns, huge castles, and somewhere, the world’s older baroque theatre – at least according to them. This Pearl of Danube is actually two cities in one linked by an iconic bridge; the Chain Bridge, which is a 19th century bridge with lions that connect Buda and Pest. And yes, it’s worth taking a long walk on. Its restaurants serve up traditional takes on Hungarian cuisine which pairs perfectly with their affordable local wine. And since we’re talking about cuisines, you should also try their world-famous desserts and sample their cakes, crepes and tortes! Budapest also famous for its massive hot springs bathhouses, ready to relax any local or tourist. It also houses countless churches, monuments and museums. My favourite has to be Prague though… because I’ve been there and I’m biased towards it. But as for places I have not gone and want to, I’d say Budapest is top on my list. Where would you head to first if you had all the money and time in the world?